First, you’ll want to locate where your roof leak is. Head up to your attic with a bright flashlight after a heavy rain and thoroughly inspect the area. When you find the area that’s wet, carefully inspect it to see where exactly the hole is. To locate the leak on the exterior, take a measurement inside and transfer it outside. Place you ladder securely up against the side of your home and climb up to your roof. 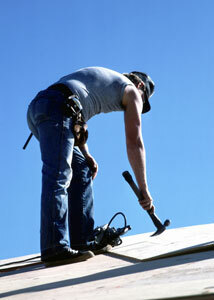 Lift up the damaged asphalt shingle, then use your hammer to remove the nails attaching it to the roof. Remove the shingle and use your pry bar to lift the shingle above it. Cut your new asphalt shingle to the right size and slide it under the shingle above it to cover the area. Fasten the shingle down with your hammer and nails. Coat the head of each nail with roofing adhesive and press the shingle above down on top of the nails to secure. Once the adhesive is dry, your roof should will be patched and should be able to safely repel water. If patching a roof isn’t something you want to tackle, we encourage you to contact our roofing experts. At P.J. Fitzpatrick, we have been satisfying customers since 1980. We can repair virtually any roofing situation quickly and professionally.